Remember iPods? The things that switched Apple from a computer company to the electronics company, the most valuable in company in company history? There hasn't been a new one in two years. Today, it's back, upgraded, widescreen-ed, and super skinny. 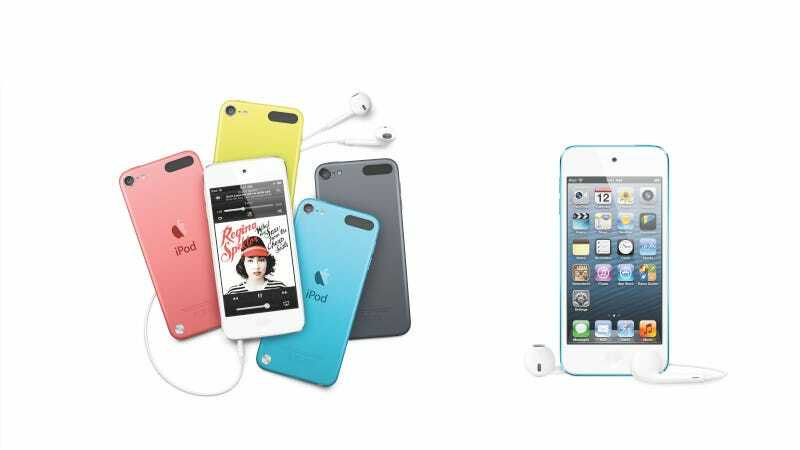 Unlike previous models, the new iPod Touch looks more like the new iPod Nano than the new iPhone—but that's awesome, as it weighs in at 88 grams and is only 6.1 mm thick. The new Touch will, however, pack the iPhone 4S' supefast A5 processor for mobile gaming prowess, an upgraded rear-facing 5 MP camera, the new tiny Lightning connector, Siri, and, more importantly, the iPhone 5's 4-inch widescreen retina display. This thing will be lovely for pocketable movies. These new guts will still get you 40 hours of music playback, and eight hours of video. You'll even be able to use it to power your home theater, with built-in 1080p mirroring to your TV via AirPlay. It'll also come in five colors, and, for some reasons, sports a little knob for a wrist strap if you feel like being laughed at as you walk down the street. You'll be able to dangle it from your hand like the little fop you are when it ships this October, starting at $300 for a 32 GB version, which is too expensive. But let's be clear though: this is easily one of the best gadgets Apple's ever dropped. Amazingly thin, gorgeous screen, iOS 6's software sophistication, a decent camera, fantastic games, The Internet, all able to slide into your skinny jeans. A fantastic pocket computer. This iPod is just as impressive as the iPhone today was dedicated to.